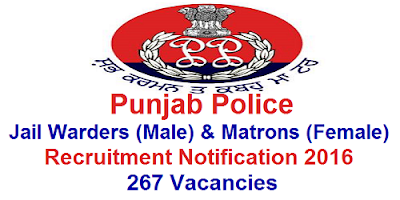 Punjab Police Recruitment Notification 2016: Punjab Police Recruitment Board released one more notification regarding Department of Jails 2016 recruitment for warders & Matrons posts on 8th November 2016. Warder posts are for male candidates and Matron Posts are for female candidates. This recruitment notification of Punjab Police is for 210 Warder (Male) posts and 57 Matrons (Female) posts in Department of Jails, Punjab. Punjab Police recruitment board is inviting all the eligible candidates to apply for this recruitment through online and the online applications for this recruitment are available from 8th November 2016 on official website http://punjabpolicerecruitment.in. The Government job aspirants who are eligible as per the post requirements of this recruitment can apply for this recruitment of Punjab Police on or before 28th November 2016. Before going to apply for this recruitment go through the entire details of the notification just to know about the basic details of the recruitment like number of vacancies, Age limitations, educational qualifications, physical standards, selection procedure & etc. After getting an idea about the recruitment notification and if the candidate is eligible for this recruitment then proceed further. Here we provide all the essential information of this notification which the candidate needs to know before going to apply online, go through these details which are given below. No. 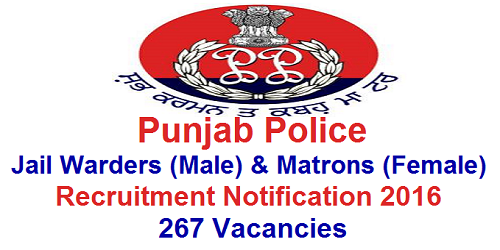 of Vacancies: Total number of vacancies available in this recruitment is 267 warder and matron posts in Department of Jails, Punjab. Age Limits: Age is considered as on 1st January 2016 and upper age limit relaxation is applicable for the candidates belonging to SC/ST, BC, Ex-Servicemen and widows/divorced women/women have been living separately from their husbands from more than 2 years (because of their desertion) based on the government rules. For age relaxation details of these categories go through the official notification of this recruitment, the link is given below. - 10+2 or its equivalent from recognized Education Board/University. Physical Standards: these are minimum required physical standards of male & female candidates. 1. Physical Measurement Test (PMT): the candidates, who are eligible based on the minimum requirement for the recruitment (Age & Educational qualifications), shall be allowed in PMT. 2. Physical Screening Test (PST): The candidates who qualify in PMT will be participated in PST. Offline: Pay the fee in any branch of HDFC through system generated challan form. Online applications are opened from 8th November 2016. Closing date for online applications is 28th November 2016. Closing date for deposit Application fee is 30th November 2016.